I’m amazed this book came out because Tia Torres—in the living, breathing, flesh—told me that she’s a private person and that a memoir would never happen. I’d love to post a photo of Tia and myself at her speaking event, but sadly my tech neophyte husband had some difficulties with my phone. Needless to say, I’m still a little bit of a salty dog about that. But don’t worry, Tia. One way or another, I will find you! Hmm…that sounded a little creepy, didn’t it? Either way, I’m SO happy she finally shared her story in this slim volume chronicling all of the special dogs she loved and lost. That said, grab some tissues because every chapter ends with the inevitable conclusion we all fear in dog books. If this wasn’t penned by Miss Torres—my idol, my moral compass, my muse—I would give it a hard pass due to the pain that comes with saying goodbye. 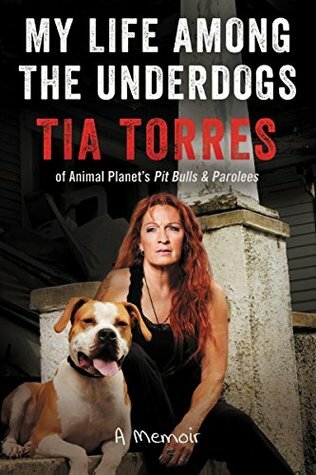 But I’m glad I stuck it through because I learned so much about Tia’s journey from wolf rescuer to Hollywood animal trainer to her own Pit Bulls and Parolees rescue/TV show. Wow—what a ride! The best way to read this book is via audio because Tia narrates the story herself! I’ve always been curious about her family life and had a theory that her parents failed her. This seems to be the case for a lot of us dog rescue diehards—myself included—and sure enough, my theory was correct. She had her ups and downs while growing up in East LA (again, relatable) but yet, somewhere along the way she discovered her higher purpose. That, right there, is one of life’s little miracles. Let me tell you, this woman is incredible. I’m just amazed at how someone from a hard-scrabble background could have the time, energy and resources to build the nation’s largest pit bull rescue ranch. This is an accomplishment I could only fantasize about—but she just went and did it! Not only is she rescuing thousands of dogs’ lives, she’s also rescuing the humans that society has thrown away. She is virtually lifting up, rescuing and rehabilitating traumatized—not to mention stigmatized—dogs and humans. Give this woman a Nobel Peace Prize, please. My only disappointment is that this book didn’t delve into the parolees aspect of her story, probably because that journey needs to be told in a separate book. I would’ve loved to have learned more about some of the longtime parolees-turned dog rescue heroes. Several of whom have gone on to live happy, successful lives after they left the ranch. I’m much more interested in dogs than humans, but let me tell you, it’s Niagra Falls when I watch the former parolees thanking Tia at their weddings. And then there’s her two twin sons whom she rescued from a terrible family situation that, of course, she didn’t delve into out of respect for their privacy. That chapter really tore me up because her love for them, and vice versa, is truly beautiful. I’m not ashamed to say that when I talked to my therapist about this book, I cried like a little baby when I mentioned this part. Hmph! I will not get on my soapbox and rant about the horrors of breed discrimination, but I will say that it needs to stop right now. Tia and her kids (aka “skin-babies”) are doing an amazing job debunking all of the false beliefs people hold against these “muscle dogs.” Just read the chapter about her youngest daughter taking a bubbly bath with her new best friend—a pit bull that was just pulled off the streets—and maybe your perception will change. I hope it will. There’s a lot of great dog stories in this book—from the ill-fated J-Lo music video (LOL!) to Blue’s last final farewell at Tania’s wedding. She had me in tatters at, “Til death do us part.” As with everything in life, there’s a lot of joy and pain that comes along with dog rescue—but boy is it all worth it. As they say, it’s better to have loved and lost than never to have loved at all. On that note, I’ll just say this book gets four paws up! Watch the show, read the book, send them money and hug your dog every chance you get.